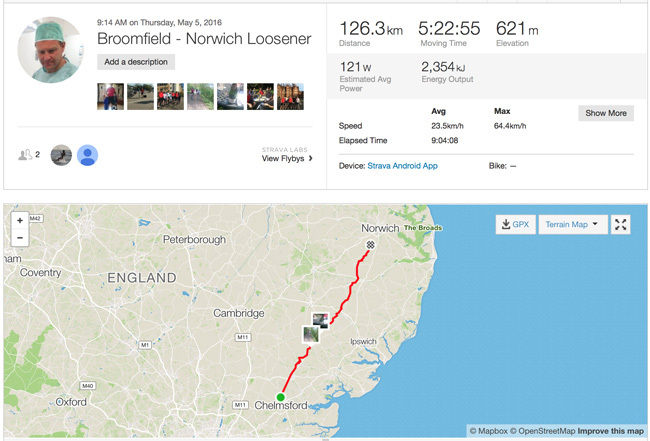 On Thursday 5th May Mat Griffiths took part in fundraiser for Lymphoedema by cycling over 80 miles from the St Andrew’s Centre to a microsurgical meeting in Norwich. The fundraiser, which started at St Andrew’s, was to raise money for a ‘Perometer’ device (pictured), which will enable us to quickly and accurately measure limb volumes at St Andrew’s Centre. 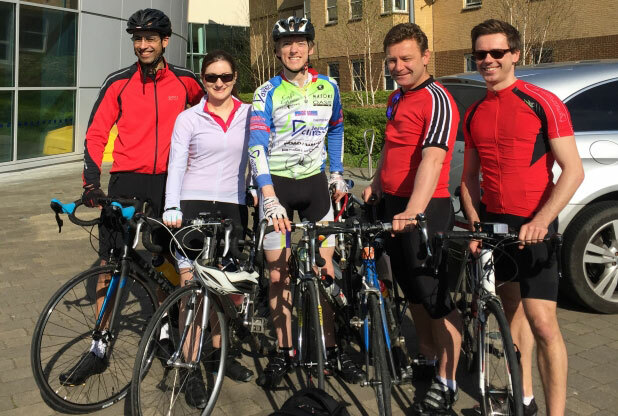 With a fair wind and warm temperatures the ‘Lymphomaniacs Group’, a bunch of amateur cyclists/surgeons, set off from Broomfield Hospital to ride to Dunston Hall, Norfolk. Leaving on a lovely Essex morning, we set off with Russell setting a fair pace and Daniel saying he had a sore bottom yet we managed to get up through Braintree well as the rush hour had abated. The north Essex country side was spectacular as we fell off the busier roads onto quite country lanes intersperse with the occasional hills and descents in this undulating area. Lavenham was especially glorious mid-morning and as the legs felt good after the first thirty miles we treated ourselves to a champagne breakfast inspired by the accounts of the very first Tour De France in 1903 where one contestant was reported to arrive at the end of each stage demanding ‘red wine and biscuits’. Our ride was somewhat easier compared to these pioneers who covered 400km per stage on single speed bikes on dirt roads. Julia showed appropriate fortitude as she was still plagued by a chest infection form the weekend. Fortified and fluids replenished courtesy of our gallant support driver, Mary Morgan, we sped off for a faster mid-section, where we tried to rest the slower members of the team behind the leaders. Fortunately, the tail wind gently helped to encourage us however, we were hobbled by a stop for a puncture, a peacock on a wall and an impromptu live interview with Radio Norwich. In Diss we met once again with Miss Morgan and the legs were tiring at 65 miles so we stopped for lunch by the lake with ducks and to change one tyre. Some members found stronger refreshment and then all headed off with enthusiasm for the last schlepp into Dunston Hall and an ad-hoc welcome reception as we had missed the scheduled tea break. Tom was the cyclist of the day as he had cycled with great pace on my old steel Peugeot bike, a truly great performance. Mat Griffiths is an NHS and private practice consultant plastic and reconstructive surgeon based in Essex. He specialises in cosmetic and breast reconstruction surgery: breast augmentation, breast uplift, breast reduction, liposuction, labiaplasty and abdominoplasty.